With Thanksgiving just over a week away, I wanted to share my 5 tips for hosting Thanksgiving as well as three different looks that could inspire you for setting your own Thanksgiving table this year! PLAN, PLAN, PLAN! 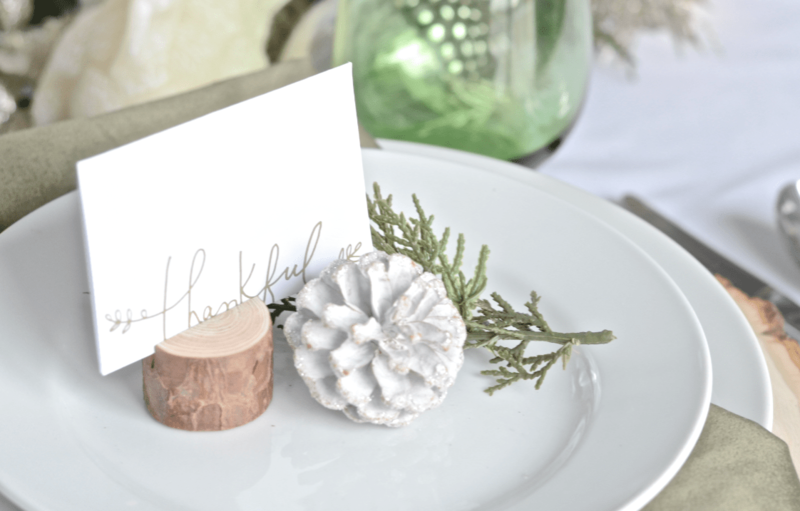 Whether this is your 1st year hosting Thanksgiving or your 30th, plan out what you will be serving or who’s bringing what, how you want to decorate and plan out when you need it ready. The key to a low stress Thanksgiving is a good game plan and great execution. Make a list of all of the food items on your menu to ensure you don’t forget to serveanything. Ie: Rolls, desserts and pies should be made the day before, or bright and early the day of. On Thanksgiving day, cook the turkey and then potatoes first. These two take the longest and are two of the main dishes. Consider cooking your turkey in a baking bag to avoid the turkey drying out and being over cooked. While those are cooking, prepare relish and fruit trays, set aside. Make the stuffing, cranberry sauce, sweet potatoes and finish mashed potatoes while the turkey finishes up. Last, pour drinks, reheat rolls (I usually put mine in the oven at 200 degrees for 10-15 min before dinner) and make the gravy. Serve everything hot at the same time! 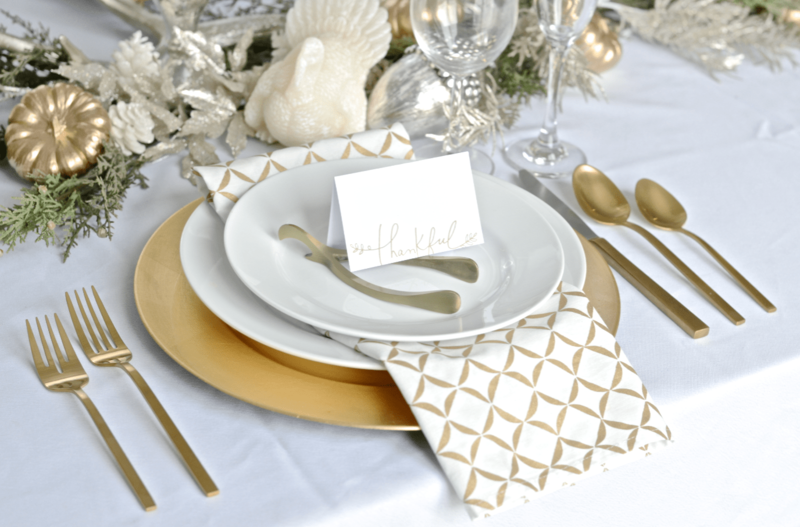 Whether your theme is traditional, modern, seasonal or just a color scheme, planning ahead will ensure you have the table and all of the details just the way you want them ahead of time. I’m a huge fan of assigned seats, its just easier knowing that everyone has a seat and it makes you’re guests feel special, don’t you love seeing your name lovingly written especially for you? Sometimes you’re able to break up cliques so guests can mingle and visit with new and old friends, when they might not have otherwise. 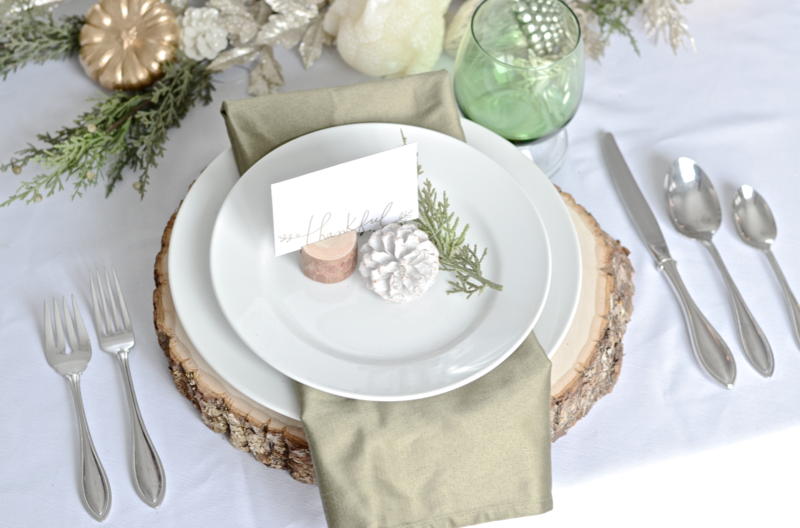 Place cards can be purchased ready-made or you could easily print your own too. If you’re on a tight budget, look around for things to make the decor beautiful and elegant. 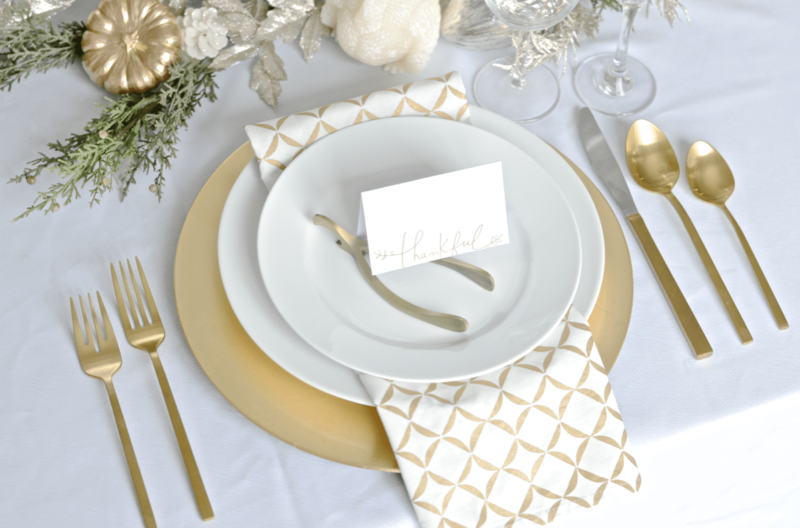 If budget isn’t a factor, challenge yourself by putting together your own ideas (Pinspirations) instead of buying the assembled place setting featured in the store. Is there a creative decor element that you could later gift as a party favor or a family heirloom you could use? The most important thing will be the memories that you’re creating. Help the guests feel welcome and keep the day happy and fun with great food, great company and fond memories.